Valencia won the EuroCup in a triumphant fashion vs. Alba Berlin. The most successful team in the history of EuroCup added yet another piece of silverware in its collection of titles. Valencia routed Alba Berlin 89 – 63 in Game 3 of the EuroCup Finals to win the best-of-three series 2-1 and lift the trophy for the fourth time. This title grants the Spanish team access to the 2019-2020 EuroLeague. Matt Thomas scored 16 out of his team-high 19 points in the first half. The American player not only helped Valencia recover from a 0-11 Alba entrance but paced them towards a decisive 46 – 33 lead at the break. Alba never bounced back. Valencia kept dominating to ultimately transform the game into a party for its fans in “La Fonteta”. With three minutes remaining the hosts even got a 28-point lead, 84 – 56. Rokas Giedraitis (19 points) Peyton Siva (14 points, four assists) were the only Alba players in double digits. 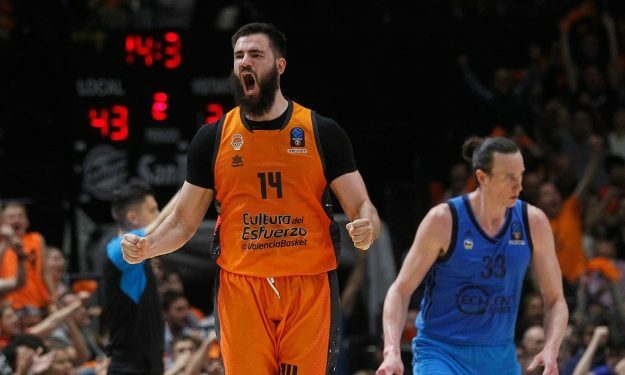 For Valencia, Bojan Dubljevic dropped 18 points and grabbed eight rebounds en route to his second EuroCup title with the “Taronja”, while Fernando San Emeterio added 18 points as well. It was the first EuroCup trophy for the veteran Spanish swingman. Will Thomas contributed 15 points to Valencia en route to winning EuroCup Finals MVP.